Blasphemy law abolished in Denmark! 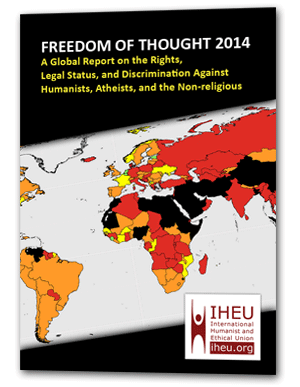 Today, Friday 2 June, the Danish parliament has voted to end centuries of “blasphemy” law! Rumours had been confirmed earlier this week that the ruling ‘Venstre’ party would join other parties including the socialist opposition ‘Enhedslisten’, which proposed the abolition, in voting for an abolition, making this morning’s vote more or less a done deal. The “blasphemy” law was abolished by a majority of 75 – 27. The Danish Humanist Society, Humanistisk Samfund, a partner in the End Blasphemy Laws campaign, has had abolition as a goal from the founding of the organisation, almost ten years ago. 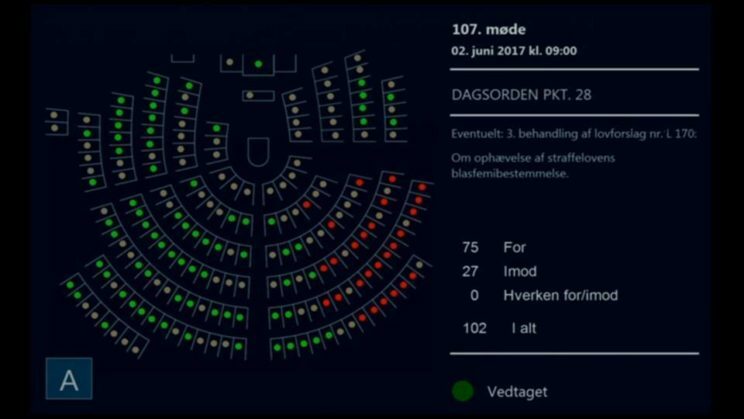 A breakdown of the successful vote to end blasphemy laws in Denmark! In Denmark the “blasphemy” law was section 140 in the Penal Code, which stipulated that a person could be punished for publicly ridiculing religious belief or worship. The penalty ranges from fines to four months in prison. In the wake of the 2005 Muhammad cartoon crisis, there was considerable debate in Denmark about whether or not the publisher or cartoonists should be prosecuted for “blasphemy”, but no case was raised. It nevertheless began a conversation about the nature of “blasphemy” laws and freedom of expression. At that time, the government decided not abolish the law. In 2015 a Penal Advisory Board in 2015 made a report on the possible use of the blasphemy law and stated that “blasphemy” might include for example the burning of holy books, and argued that therefore the law had a positive use! Indeed, the Danish Blasphemy Law was used in 2017 for the first time since 1946: a man was accused of “blasphemy” for burning a copy of the Koran in his back yard, and posting a video of this action on a closed Facebook group which contained some bigoted content. As a result of the book-burning prosecution, the socialists in ‘Enhedslisten’ with backing from the ‘Dansk Folkeparti’ (right wing Danish Peoples party) filed the proposal to abolish the “blasphemy” law. The political discussion in the run-up to the vote centred around two issues: freedom of speech vs blasphemy, and a hypothetical alleged increase in the threat of terrorism that abolition of the law might trigger. The latter was an argument that was relatively new to the debate, and critics of the law roundly rejected the logic. During political discussions on the proposal, the green, center-liberal, anti-establishment party ‘Alternativet’ at one stage appeared to have the deciding votes. One of the trademarks of ‘Alternativet’ is to handle decision making in a member-oriented way, and the party streamed a meeting of the parliamentary group, inviting speakers for and against abolition, as well as comments from the public, then left the decision on the parliamentary votes to the members of the party in an online poll. The members voted in favour of ending the “blasphemy” law. Of the three parties in the government, ‘Konservative’ and ‘Liberal Alliance’ announced a long time ago that they would vote for abolition, but the Prime Minister’s party ‘Venstre’ said it would await an investigation into experiences in Netherlands and Norway who only recently abolished their “blasphemy” laws. Today’s decisive vote means the end of “blasphemy” in yet another European country. Norway, Iceland, Malta, one French province, and now Denmark, have all abolished their historical “blasphemy” laws since 2015. Title: Blasphemy law abolished in Denmark!